A slightly disappointing start to this disc was soon made up for by good performances later on. I was first put off by both the stilted - occasionally almost incomprehensible - English translation of the introductory notes (e.g. "To untangle these threads, which have been so carefully intertwined, is foolish oversimplification"! ), as well as the minor errors in the sleeve-notes: references to the song track numbers - where they appear - are incorrect in a few cases. Secondly, I found the spoken introduction to the opening track, mildly disturbing - it comes across as quite irritatingly over-done, and the sing-songy style didn't really work for me. The notes explain, in their curious manner, that although most of France had been dominated by the male troubadour song, in sophisticated places in Northern France there was a taste for women's songs, as represented here. They were called chansons de toile, as they were both sung by ladies as they worked at the spinning wheel, and also because characters in the songs are often to be found weaving and performing similar women's work. Although the songs generally follow strong conventions, we occasionally come across an unusual song - as indeed, with troubadour songs - that seems to defy the usual principles. For example, in the haunting Belle Doette, the protagonist spends her time reading instead of spinning, her lover is killed not in the traditional war but in a tournament, and the she doesn't die but builds an abbey. Many of the songs are about love, springtime, nature, birds and animals (sweet-smelling panthers!) and similar topics. The transcriptions of the songs rely a great deal on realisations and improvisations - so, for example, we find two fables (Issi avint qu'un cers and D'un gupil), written by a Marie de France in the twelfth century, which the performer has chosen to "recite" to an anonymous tune of c. 1200, in a curious half-sung, half-spoken method. A number of other tracks are also spoken, such as Monosceros est beste, as well as a series of narratives from the Benedictine monk, Gauthier de Coincy's Miracles de Notre Dame (Que de memoyre, Quatre jours plains and N'est pas merveille), where the narrative relating the Virgin's miracles is interspersed with poems - here sung - in her honour. I am not, however, convinced that the spoken tracks work that well, and certainly find them less pleasing than the actual songs and instrumental tracks - many of which, such as Shira Kammen's syncopated, dance-like, and folksy realisation of La danse de gupil, are quite delightful. Azema has a good voice for this repertoire - pleasingly robust, yet evocative and clear, with a rather apt, slightly austere and harsh quality. She also has a nice sense of atmosphere, as demonstrated in the well-known Aussi come unicorne sui, where her dramatic singing is excellently complemented by the sparse and simple accompaniment. The concluding Je chevauchoie l'autrier is a charming track, and a good one to finish on, showing Azema's ability to characterise with contrasts in her voices according to the different characters she plays. Yet even this could be a little more sensitively done, with greater variety and insight. Although I was slightly put off this disc by the spoken tracks, it is nonetheless an interesting and enjoyable listen. 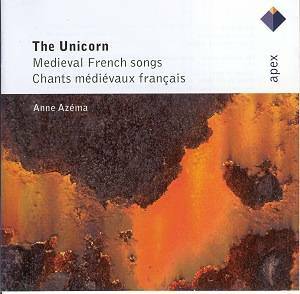 The accompaniment is extremely sympathetic, the singing pleasant, and the works themselves a fascinating insight into mediaeval France.